Adobe After Effects (AE) is a top program in today’s video and animation production industry. It does take some technical depth to learn how to use the program, which is why royalty-free AE templates have burst on the scene with such high demand. However, AE has tons of built-in features that allow you to create studio-quality work right out of the box, as this beginner’s guide to creating best-selling After Effects templates explains. Let’s face it—people are busy, and if they can save days of animating, sequencing, color correcting, and laying over 3D title shots for a small fee, they will. The Storyblocks Marketplace allows you to turn demand for such templates into your own profitable business, like I have. I’ve been working with Videoblocks for nearly 4 years, supplying hundreds of AE templates for content use in their subscription-based customer platform. Some of my templates have been downloaded over 250,000 times, which is why I was extremely excited to start selling templates directly through the Marketplace. I was dreaming dollar signs. I seriously thought I would continue to see similar downloads like on the subscription side, but what I noticed instead is that people who pay for a subscription with unlimited download potential, will download pretty much everything they can. On the other hand, people who are paying for each item are obviously going to be more precise in their decisions. So I really had to think more strategically. Why would someone want to buy my template? Who is going to buy it and how can they use it? After some serious research and development, I noticed my new outlook on template production was beginning to make an impact. I understood the issue and by taking the steps necessary to create solid AE templates, I now have consistent monthly sales in the Marketplace. So, how do you stand out and make profitable AE templates on your own, without making the simple mistakes that are common to new users? I have compiled the most important top 5 factors to keep in mind when creating a new AE template, and I hope it will assist in your conceptual ideas, production efforts and overall sales with regards to your own templates. As I mentioned, AE templates are flourishing. The most important factor for any template you create is your audience. When I first started making AE templates 5 years ago I thought just making a template that looked really cool was enough. However, I noticed that the end product was so lost in terms of a general audience that I had to seriously rethink who I was actually creating the template for. Holding a degree in computer animation, my ideas were centered around just being creative, so I was animating and producing templates that were pleasing to me and my style, rather than building a template around a true audience or the needs of a potential client. Any one of these audiences understands that having a template will not only save them time and money, but will give them the ability to promote their product quickly and efficiently in more ways than one. Once you establish your audience, all other factors such as color, font, style, audio and effects start to fall into place. I always want my templates to remain focused on the audience I am trying to promote as well as the stylistic impression I would expect if I were the audience. Your target audience must be considered throughout the entire production. For example, I would never have glitch effects and super quick transitions for a wedding album. However, for an electronic club promotion, it actually would be a great way to sell that template. As I let the audience drive my creativity, I always keep in mind the movement, effects, transitions and title styles that accent the end-user. Once you visualize these components, you will find yourself becoming more successful in achieving profitable AE templates. 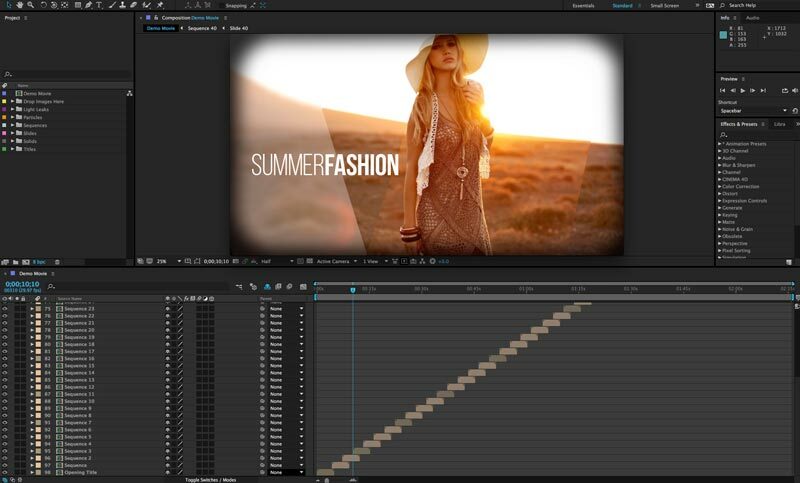 After Effects template designers have literally changed the game on broadcast television and mobile platforms. The only issue is similarity. As I scroll through template demos I can see how repetitive they are becoming; however, when I look closely I find those hidden gems, the ones that scream individuality. In some cases, those extremely unique creations maybe not be targeted towards a larger audience. Regardless, I find some of the aspects interesting enough to experiment within my own templates. I specifically look for 3D arrangements, new transition effects, the way a title animates, or something in a demo that helps describe the template in a way that even makes me want to buy it. You never want to burn yourself out trying to come up with new ideas. Nine times out of 10, those ideas have already been done. Instead, spend an hour browsing through new templates that can actually inspire you to be more unique in your creations, helping you to develop your own sense of creativity, which in the end will help you sell more templates. My philosophy is not to copy or repeat, but to take components of top-selling templates and twist them into my own. Focus on placing your own unique spin on specific elements to make them even better or appear at different times within your template to help achieve an unforgettable creation. Having a template that is meant for similar audiences is not bad, as long as it’s better, and better can mean way more than just looks. It really boils down to control and options within the user panel. If you have a simple slide show template with basic titles, ok, that’s cool, but if you take that same template and add in multiple color filters, lighting, particle effects, multiple title options and solid control panels, you now have something much more appealing that allows the user to create a more fitting end product that matches their interests and overall needs. In the early months of creating templates I found myself making it very difficult for end-users to have the control needed to make the template their own. I was literally building it around my end demo instead of thinking about what the end-user will want. I never want to limit a user’s control of the template, but actually give them full control. So how do you manage control within the design of a template? With proper effects and expression controls. Make sure to have all your expression controls in single adjustment layers so it’s easier for your user to navigate and experiment with. The concept I came up with is to create one sequence first. This sequence is comprised of a single media element (image or video clip), which I always label as a “slide.” With my slide composition dropped into my sequence composition, I begin my experimentation with effects and titles. I create a single adjustment layer that will ultimately become my expression control panel, allowing me to create expressions built around all the effects I add to this sequence. It’s good practice to address each effect added, giving the end-user the ability to turn on/off every effect, change font color and re-size specific elements. I’ve found this to be the most productive way in addressing controls within templates because I can duplicate my final sequence, which maintains everything I have created in each composition that I copy thereafter. Clients particularly appreciate this because it allows them to experiment and find the right setting for their own personal creativity. This process also gives end-users the ability to create longer movies; by having the control panel built into each final sequence, they only need to duplicate as many sequences needed to reach the final time length desired. Incorporating these effects will always add another dimension to your movie. However, the more control you give to your effects through your control panel, the better your template will become. I always try to have multiple options for added effects. For example, instead of having a single color effect that fades all images within your template, have five or more varying color effects that can easily be turned on and off through an effects control panel. This will give the user more options when creating their final movie, because your fade effect might look great, but it may not be what the user is looking for. Having those options will increase sales and keep users coming back to your templates. I never want to confuse someone who buys a template I created. The most frustrating moment for a user is watching an amazing demo, only to get inside the production files and become totally lost from the start. The most important piece to creating a successful end-use product is keeping it organized and compatible for a user to manipulate. I became stronger at organizing my templates over years of practice. The main objective to streamlining your files is a minimalistic approach. I have seen some templates that have tons of pre-composed files, which is not technically a bad way to go, however if you can achieve the same look with the same control options in less compositions, then less is better. Keeping folders in color-coded arrangements helps significantly, and also maintain obvious titles and layout associations within your template. Utilizing a process like this makes it easier for a new AE user to locate specific elements of the template in order to edit or customize an end project. Another piece of organization is having modular compositions, meaning each of your primary compositions is sequenced together in smaller amounts of time, allowing for media transitions to seamlessly work one after the other. I have found that modular compositions work extremely well because they allow end-users to mix-up or extend the movie sequence to a length that fits their needs. You never want to build out a demo that only fits one time length, meaning the template is a single composition. You always want to build it out with flexibility and modularity in mind. The best way for a user to benefit from a template is to simply upload new images, change the titles and basically hit render. Never make a user go in and edit key-frames, re-animate sequences or manually create titles for new sequences. Establish your own method that makes it clean and easy to navigate, and of course, navigation would be nothing without proper documentation. Remember that the potential buyer(s) of your template may not be as skilled as you are in AE, so you may need to describe things as if they have never opened AE before. If you really want to impress your end-user, create a video tutorial, which can easily be done by using a video recording of your screen from inside QuickTime. Use your built-in microphone during your recording to voice out what steps you are performing; if you don’t have a microphone, use a voice-recording app on your phone and just sync the audio to the recorded video later. Post it online and add a reference link in your documentation. Video tutorials are more difficult to produce and obviously take more time, but in the end, your end-user can visually see exactly what you are doing and can benefit greatly from watching the process, rather than just reading every step. They will also be more inclined to look for your templates next time they are in need. The most important aspect to your template is a great selling demo. Create a demo of what everything rendered out will look like and then create video recordings of your key elements like expression controls and effects, which you can add in at the end of your demo to enhance the overall selling features of your template. You want to showcase all the bells and whistles and make sure to describe everything your template can do. You want to develop a punchy intro, solid content feature and strong ending. The demo should appeal to your audience and be overlaid with a thoughtful explains audio track. Having audio that is synced with transitions onscreen will significantly increase the visual composition and become more appealing artistically than audio that is not in sync. Strive for your demo to be as professional as possible; this means checking for spelling and grammar. Believe it or not, when users notice misspelled words, they often immediately think that the creator is immature, inexperienced or just in a rush to get it done, which can hurt overall sales. When looking for free professional-quality content to use in your demo, search for desktop wallpaper sites that allow you to download categorized wallpaper images in HD. In your final template you will just need to delete this content and replace it with simple dummy images as placeholders. So, if making profitable templates is on your mind, just remember your audience, be unique, give your user control, stay organized, and make it easy to modify through great documented tutorials. 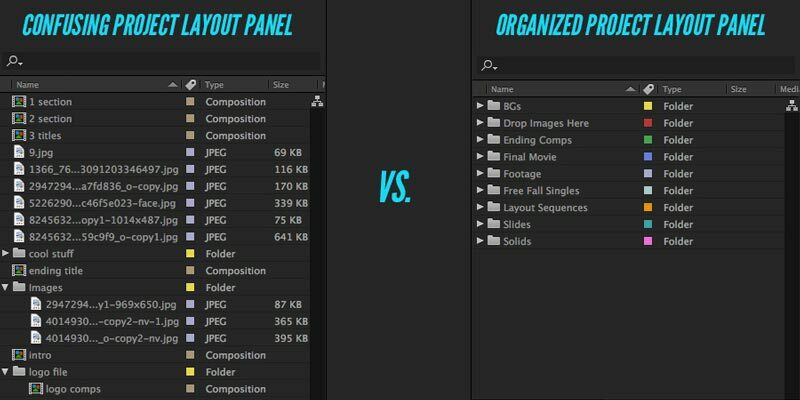 If you consider these key factors, you should be making profitable AE templates in no time. Already have After Effects templates that you’d like to sell? Get started today by joining the Storyblocks Marketplace. Or, if you’re in need of a huge variety of pre-designed AE templates, explore the Videoblocks library. Ryan Nau is an After Effects hero and long-time VideoBlocks contributor. Explore his portfolio.